Although I am really not interested in tractors, have never owned one nor ever will, sometimes I watch the Mecum Auction for tractors for a few minutes on RFD-TV. What puzzles me are the immense sums that the mostly older men in the crowd seem to be willing to pay for old tractors. Among the few tractors I saw being auctioned off there was a 1970 Allis-Chalmers for $ 83 000. And I thought the agricultural community is in financial trouble with low commodity prices and a sea of milk flooding the markets so that many are leaving the field (not avoiding to crack a pun here). What is going on here? 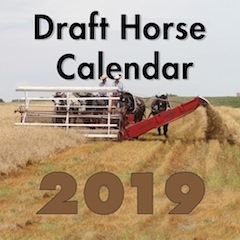 And we in the draft horse community thought recently that buyers have gone bonkers with the sale prices for well-trained , and even not so well trained draft horses. Collectors, not farmers. I, too, sometimes watch the tractor auctions. I had a Massey Harris 44 gas narrow front tractor on the farm when I bought it and couldn't get rid of it fast enough because it was so dangerous on the hills. There were guys lined up to my door because this tractor had all its fenders and the hydraulics that worked. Of course, 30 years ago I didn't get much for it. Amazingly, collectors will buy pretty much anything that is in short supply. Once a year in our area there's a gathering of tractor collectors. Some still farm. Others not. But they have a parade of these old machines, driving from town through backroads and on to where they meet up. The route went by our farm and I watched as maybe a couple hundred spotless vintage tractors chugged by for a half hour. One of my neighbor's stopped by with his last fall. He was giving his grandson a ride and I invited them by so he could meet my mules. Seeing one of these old machines up close was interesting, considering how old it was (1947~) and that it looked about like brand new. Old iron, whether engine or equine powered, has a lot of longevity in it, with proper care. There are a lot of buyers for the old Ford 8N-9N tractors around here. These things go for $3000-$5000. I know because I have sold and bought a few myself. I gave up two years ago and sold the last one I had and bought a new Kubota about the same size. I would sure like to do a lot more with a team, but lifting heavy harness is out now days and I haven't found a horse or team that can do all the lifting around here that a front end loader can. Nor can they work a 60"snow blower in 3 ft of snow. Most of these high prices for older farm equipment comes from collectors as mentioned. Attend a auction with a lot of old horse drawn equipment and one sees the same thing. Any wagon with a box and roadable will go for $5000-$8000 and then if it had a seat with it, they sell it separately for $300-$800.The sad thing is those good wagons usually end up as yard pieces for the well to do. The same with those high priced old tractors that usually end up sitting in a barn/garage except for parade. Look at prices for new tractors farm equipment and those older high priced tractors aren't too bad.Of course a person can get sticker shock looking at prices for new horse drawn equipment as well. Those people who graduated high school then went to town and got a real job now are missing there roots of where they came from, sometimes there children. They have more money than the rest of us do but we have memories that there trying to buy. I know it is hard to tell I was home when my dad died talked to him every day including the day he died, he came home from the Hospital 30 days before to die at home. I talked to my mom the night before she died at 5 in the morning, the same time of the day that I was born. they both knew that I had to go and finish the job and there eyes said good by and let go. My life is getting closer to the end, not soon I hope I have no plans to go yet. But I'm happy with my life and with what I have done with my life. I have done a lot, I did what I wanted to do when I wanted to do it. I can't ask for more I'm Happy I don't need to buy anything to make me happy. I have friends all over the country, and they know who they are If god is willing I will go a lot more auctions and events just to visit with some more new friends. thanks for posting and reading the post. I know on the high priced horse side of things it is hard to get a well broke riding horse or work horse. When I was young it was much easier to find a older horses that where well used and well broke, they where used up for everyday work but had lots of life left for trail rides, kids, etc. Now people wanting a horse or mule like this has to pay more. Supply demand. I love old horse drawn equipment, steam engines, tractors, cars, pickups, etc, that have been fixed up and glad some people have the means to buy them and show them off. It is hard to believe what some of this stuff is worth. High scrap iron prices have sure got rid of a bunch of history.